Ulaganayagan Kamal Haasan, Gautami, Niveda Thomas, Esther starred Papanasam  The official remake of blockbuster Malayalam film Drishyam, has completed its censor formalities with a clean U certificate and no cuts. 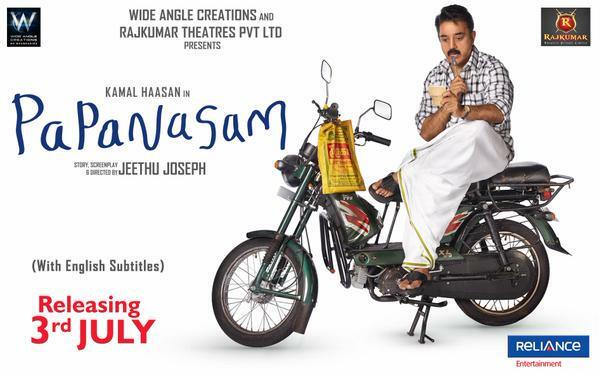 Another good news is about the release, as the makers of ‘Papanasam’ has finally confirmed the release date of this movie. This Kamal Haasan starrer will reach the theaters near you on July 3rd, and this is now a confirmed news from official sources. The news have set a huge wave of happiness among Kamal Haasan fans, and they are now celebrating it all over Facebook and Twitter. Kamal Haasan’s previous release, ‘Uttama Villain’ was not a commercial success even though critics praised the performance of Kamal in the movie. The actor now aims to deliver nothing less than a blockbuster through this movie. Directed by the original director Jeethu Joseph, Papanasam is the story of a cable operator, who is traversed by a tragedy when a youngster enters their life. How he changes the original state of situation is all about the movie. The Malayalam and Telugu versions of Drishyam starred by Mohanlal, Venkatesh and Meena were superhits and now it has to be seen how Kamal-Gautami [Tamil] and Ajay Devgan-Shriya [Hindi] reprised it in respective languages.